We'd all probably like to think that, in a time of crisis, we'd rise to the occasion and behave heroically. But let's be honest. None of us really knows how we'd behave in a sudden, dire situation until it happens. 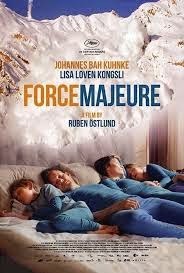 Which is why, uncomfortable as it may be, we can relate to Tomas (Johannes Bah Kuhnke), the protagonist of Ruben Östlund's FORCE MAJEURE. Tomas is on a ski vacation with his wife Ebba (Lisa Loven Kongsli), son Harry (Vincent Wettergren) and daughter Vera (Clara Wettergren). The family is all smiles as a resort photographer has them pose for pictures, but that all changes when a controlled avalanche goes as the family enjoys and outdoor meal. While Ebba's first instinct is to protect her children, Tomas runs away without even glancing back. Fortunately no one is hurt, but as you can imagine there's some tension between husband and wife. Tomas' refusal to even admit what happened only makes things worse. At one point in the film, Tomas' friend Mats (Kristofer Hivju) tries to rationalize his actions, comparing Tomas' behavior to parents on a plane that loses cabin pressure putting on their oxygen masks first so they can help their children. It's fairly obvious neither he nor anyone else really believes that, though. Having so utterly failed in his role as protector of his family, is there any way Tomas can possibly redeem himself? Östlund plays this situation for both laughs and discomfort, using it to dig deep into idealized notions of masculinity and family. It's not exactly what you'd call a laugh riot, but it does generate its share of dark chuckles even as it asks us to ponder whether we would have behaved any better than Tomas. 4 out of 4 stars.